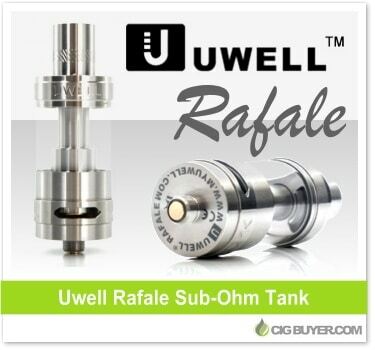 With a new and improved top-fill design, anti-spitback system and powerful dual parallel coils rated up to 120W, the Uwell Rafale Tank is undoubtedly a top performer in the sub-ohm tank space. Just like it’s predecessor, the Uwell Crown Tank, the Rafale offers amazing airflow with massive, dual cyclops air slots, but it holds more e-juice (5ml) and features high-power 0.2 ohm (60 to 120W) or 0.5 ohm (40 to 80W) SUS316 coils. An optional RBA kit is also available for DIY’ers.